The 2018 Mini Cooper S E Countryman All4 has a long name and a smaller battery than almost any other plug-in hybrid in existence. But even though it’s a small step toward electric driving, it’s got a lot of personality for a car you connect to a wall socket. Being a Midwest boy, the pure joy of a weekend trip Up North is something deeply embedded into my bloodline. I thought this electrified Mini would prove itself adept for this kind of use, but after a few days in the Hudson Valley, I came away thinking it’d be a solid daily driver for those who want some electric juice but aren’t ready to ditch the internal combustion engine just yet. Over Thanksgiving, my girlfriend and I locked down a place in upstate to spend the holidays in solitude, away from the frenetic nature of the city. The Countryman proved useful for both city driving—of course, it’s heavier than your traditional Mini, but it still can zip around traffic with ease—as well as long, winding treks. Put simply, it’s a well-rounded, sharp-looking car, a perfect weekender that comes with enough electric range that could seriously benefit someone who has a short daily commute. The Countryman has the same character inside and out of a standard Mini Cooper, but it’s built out to the size of a compact crossover. With the Countryman eAll4, Mini expanded with a plug-in hybrid that’s powered by a 1.5-liter, turbocharged three-cylinder engine and a 65-kilowatt electric motor that. All together, it pushes out a claimed 221 horsepower and 284 lb-ft of torque, which is more than even a turbocharged Cooper S Countryman (yes, the names have gotten silly) has. Acceleration’s not bad in this class either, skipping from 0 to 60 mph in a reasonable 6.7 seconds. Very witty, very sharp observers are quick to point out how puzzling the hybrid Countryman’s specs are to the naked eye. As an electrified offering, at first blush, it may seem like a throwaway: there’s only a mere 12 miles of electric-only range emanating from the car’s 7.6-kWh battery pack, one of the smallest offerings in the field today. Yes, that’s dwarfed by a Chevrolet Volt or a Prius, and with a base price of $36,800, that’s a lot of bread to throw at a hybrid that packs so little electric-only mileage. But by the time we arrived at our Thanksgiving weekend destination, I dropped any pretense about Mini’s hybrid offering. I think there’s a decent case to be made for the utility of an electrified Countryman. Whenever we needed to head into town for groceries, it was only a few miles each way. Daily commutes are getting dreadfully long for Americans, but when it comes to electric and hybrid cars, I think we tend to forget a sizable chunk of us only drive about 10 miles or so per day. Is that enough for the masses? No. But it still clocks in around 270 miles combined, so I think it’s a reasonable fit for those who need a second car, want to save a bit on gas, and have short, daily drives to make. Mini readily notes that plugging it in is “entirely optional,” as the power from gas engine’s will recharge the battery to 90 percent with normal driving. But if you can plug it in, a full charge with a basic connection can be achieved in a few hours. As for its abilities as a stuff-carrying car otherwise, the Countryman seats five comfortably. The trunk could hold a few overnight bags and a decent set of groceries. 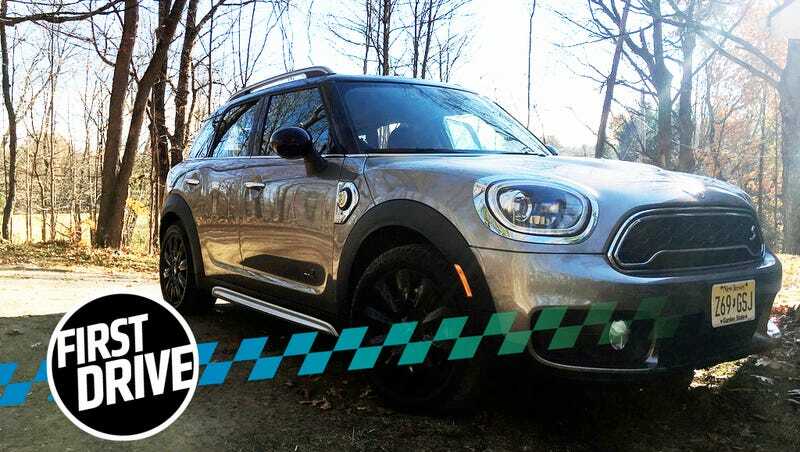 My esteemed colleague Mike Ballaban tested the non-electric Mini Cooper S Countryman—honestly, how much do you like that name?—and found what’s inside to be particularly enjoyable. The car comes packed with helpful goodies like rear parking sensors, a rear-view sensor, heated seats—all stuff you’re familiar with. But with the Countryman’s sharp interior, it’s a super nice package. The layout of the dashboard itself seemed super intuitive. For everything it had going on, the Countryman was surprisingly easy to just hop into and shove off in. There’s an add-on package for $2,250 that brings a heads-up display and Apple CarPlay along with a few other technological toys, which maybe you could do without. The HUD’s sleek appearance, popping out whenever you flipped the car on, was a nice futuristic touch though. For how much I enjoyed the interior and hard key placement, the infotainment system running on a prominent 8.8-inch touchscreen didn’t make for an easy user experience. Entering addresses is still frustratingly time-consuming, as it is on many modern cars, and it stood out as a sore spot thanks to the otherwise pleasant interior. The driving experience itself is also... just fine. It can shoot out of holes fast enough to handle highway merges with ease, and it handles bends and turns with aplomb, but this isn’t really car for driving enthusiasts. It’s not going to blow people away with everyday performance the way, say, a Volkswagen Golf R can. It’s just a nicely-packaged daily driver. And that’s OK! Yeah, maybe it’s nitpicky, but is the barrier next to the start/stop really necessary? I must’ve hit one of those things a few dozen times while trying to just fluidly start the car during the few days I had the Countryman. It was annoying. Honestly, I just want to see if this thing sells. I think the electrified Countryman has a legitimate value proposition for people who do some low-speed local driving but don’t exclusively buzz around a city. For people who like the idea of an EV and a Mini but aren’t ready to commit to life without gas, there’s something there. On top of that, Mini’s a brand with more distinctiveness than some of the other car companies offering efficiency-focused models. With every automaker barreling toward electrifying their fleets, Mini took a super-tiny baby step here. Mini has indicated it might transition to an all-electric approach itself, so this could be a test case for the automaker. The model we drove was priced at $39,700, thanks to the addition of the HUD (which is, I think, worth the extra loot), parking assist features, and the car’s sharp metallic silver paint job. That puts the Countryman around the Audi Q3, BMW X1, and the Mercedes GLA—so there’s stiff competition here. If you like Minis, and you like a Mini that’s larger than a regular ole’ Mini, then this Mini’s probably for you. Ballaban thinks the Countryman has the face of a pug but what does he know.. The brand just doesn’t read as a cute gimmick to me. Up the block from me, someone has a well-groomed Mini Countryman parked in their driveway (yes, they have these in New York), and I always marvel to myself about how that seems like a sensible car for the city. It makes sense for your typical suburbanite, too, though. My hometown’s full of drivers who make basic, short commutes every day, and the thought of saving some extra change on gas surely could be of interest to them. The Mini has a well-defined look, too. Everyday people know a Mini when they see one, so right there you got curb appeal. And it’s electric, somewhat. But that makes it unique, and if nothing else, that gives the hybrid Countryman an edge. A unique small crossover in 2018. Who could’ve thought of such a thing?